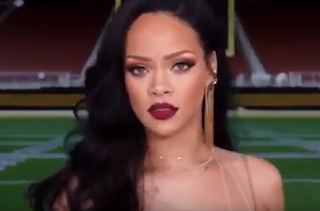 The most marketable celebrity in the world, Rihanna, was just featured in CBS official promotion of two of the networks most watched nights on tv: The Superbowl 50 (Feb. 7) and the 58th Annual Grammy Awards (Feb. 15). It shows Steven Colbert flipping a coin to determine who goes first (the superbowl or the grammys), and with the SuperBowl winning, Rihanna let's us know, "She is worth the wait." Not sure if the most digital selling artist of all time will tie this in to her release date for her new album, but again she is worth the wait. It definitely will help her to be seen in households she normally wouldn't. With her out of the box marketing strategy with Samsung: AntiDiary, we are able to see the genius behind her becoming the most marketable celebrity. Great marketing strategy again from Rihanna.